A place to share with you what I’m currently loving this season, either things I’ve bought, come across or been given that I think deserve a shout out. With Christmas and a January birthday I’ve been spoilt with some wonderful presents from my family. 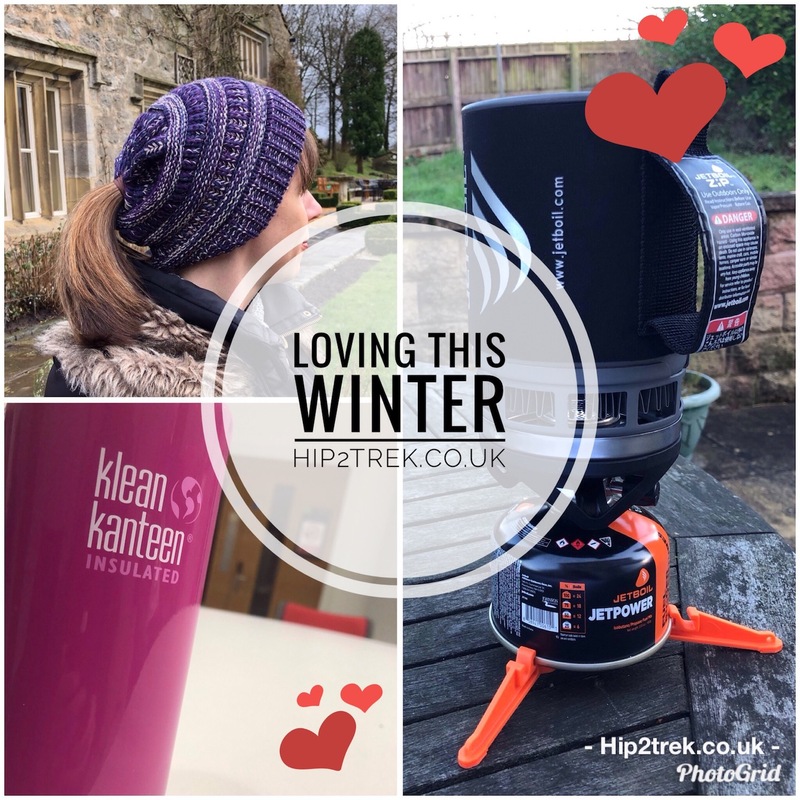 If you’re looking for something to treat your outdoor loving Valentine here’s a few ideas. I’ve had my eyes on the Klean Kanteen bottles for ages. We’ve got a number of their reusable straws and I like their attitude to more environmentally friendly products. The insulated bottles can keep your drinks hot for over 10 hours, and cold for up to 30!! I’ve not yet put this to the test and timed how long my tea stays hot though. For my 40th birthday my sister treated me to one of the bottles for my outdoor adventures, but the bottle has also seen me through cold chilly nights at night school. With interchangeable caps, easy to wash and cool bright colours it’s a lovely bottle to add to my outdoor collection. Ok, I’ve no idea what these should be really called but I’m loving my Pony tail friendly beanie! I hadn’t realised they existed, but my running friends assure me that they’ve been around for ages. There’s nothing worse than a cold head but the big lump of pony tail pulling your hat off the back of your head. With this one my head is warm, and my pony tail free out of the hole in the back. If you have the proper name for these please let me know! Are you in the camp that knew they existed? Or the camp that had no idea?! I’ve finally got a Jetboil! For Christmas, I finally got a Jetboil gas fed stove, a portable and compact system that quickly boils water to prepare tea or rehydrated meals whilst out hiking. I’ve only tested this out briefly in the garden but have seen many of the outdoor bloggers using theirs. There are a few different systems in the range, including one that you can simmer and cook with. I’m hoping to take it on many outdoor adventures so will let you know how I get on. What are your favourite things this winter? Let me know in the comments.